An entertaining character study here keeps us entertained long before we get to the meat of this thing, which is the knee capping incident heard round the world. Here’s a movie about the girl who was allegedly behind the Nancy Kerrigan figure skating knee-capping incident of the early nineties. It was crazy when it happened, and it’s kind of unbelievable that they haven’t made a movie about it up until now. This film presents the story of how horrible Tonya Harding’s life was as a black comedy / mocumentary. The formula works. Instead of being crushed by how awful these people that Harding was surrounded by were, the movie gets us to laugh at the ridiculousness of the ways they think. But the story isn’t quite as great as it should be. Most of the film is about Harding’s life before the Kerrigan situation, and that life is more or less non-stop abuse (from both her mother and her husband.) Once the story heads into the knee-capping situation, called “the incident” here, it really picks up steam. 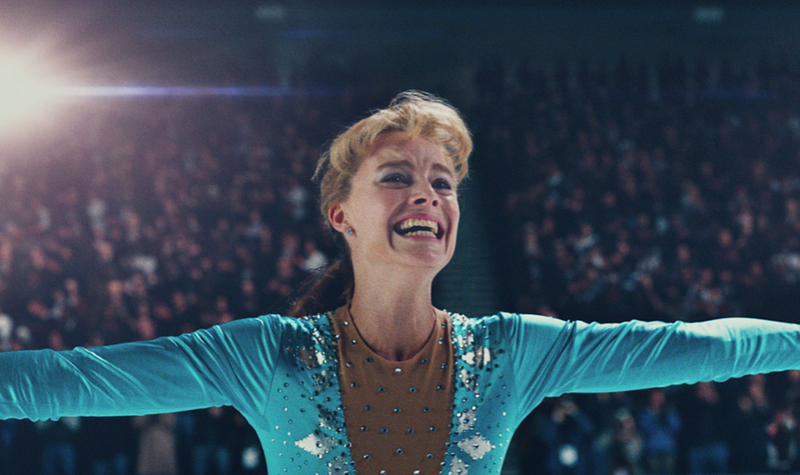 I, Tonya is the story of Tonya Harding. For those who lived through it in the nineties and remember, Tonya Harding was a figure skater who supposedly had her competition, Nancy Kerrigan, capped in the knee. She and her husband were responsible for having a man come in a use a weapon on Kerrigan to break the ice skater’s knee cap. It was found out that Harding had some involvement in this, one way or another, and she was barred from ever figure skating in competitions again. This is her story. This movie is about strong, unique characters, and the one who is by far the most unique is Harding’s mother. Allison Janney plays LaVona, and it’s a role that she won an Oscar for. It was well-deserved. This character really does make the movie and give it the edge that it needs. Steve, Harding’s husband (played by Sebastitan Stan,) is a scummy character too, but he’s more of an idiot here, whereas LaVona is basically pure evil. And that’s established early on by seeing the way she interacts with her daughter when Tonya is just a little kid. We see Tonya on the ice, wanting to come off to go use the bathroom. Her mother insists that she payed for this time on the ice, and Tonya is going to use every minute of it. That’s when Tonya reaches a point where she can’t hold it anymore and pees on herself. There are plenty of other moments like this too, including the mom refusing to stop smoking at the rink, and calling names to the other mothers who are there. She’s a pretty awful person, and the humor comes from the way she does everything coldly, without getting worked up or raising her voice. She just stands there with her cigarette and commanding presence and dominates. We see Tonya’s father run out on them, when Tonya is just a little girl. It’s a pretty sad moment as the girl runs after her father’s car and pleads with the man to take her with him. The father tells her to move out of the way, and then drives off. He’s not exactly the greatest guy either, but you can tell by the way Tonya wants so badly to go with him, that her mother is a thousand times worse. At least with her father, they had some bonding and kindness, like in a hunting scene early on, where he taught her the skills. With her mother, everything is about competition, being the best, and showing no mercy or compassion. Even romance and relationships for Tonya are done only with her mother’s permission and according to her rules. So on her first date with Steve, Tonya has to take her mother along as a chaperone. And LaVona asks all sorts of inappropriate questions, such as whether or not the two of them have slept together yet. LaVona doesn’t exactly approve of Steve, and maybe that’s exactly what Tonya likes about him. Later on, LaVona tells Tonya that she married the first guy who told her she was pretty, and this might actually be true. Steve seems to be Tonya’s first boyfriend, and what that probably means is that she couldn’t wait to get away from her mother. The first guy who showed any interest in her, she went and married. And Steve turns out to be a total jerk. He’s extremely abusive of Tonya, hitting her every chance he can get. Tonya’s relationship with her mother isn’t much better, and that one turns physical too. In one incredibly memorable scene, Tonya and her mother are both throwing things at each other, and eventually the mom throws a knife. It hits Tonya right in the arm and starts bleeding. With Steve, there are no weapons used, but it’s more like constant punches in the face. Anytime Tonya isn’t especially nice to him, or they aren’t quite getting along, Steve uses violence to express his frustration. And then we get to the incident. It’s at least half the movie before we reach this point, and of course it’s the thing we’ve been all waiting for. The movie even tells us that, saying something like, “this is the part you’ve really come here for.” This is a very meta film in that way, where the characters talk to the camera and break the fourth wall to not only reflect on their lives, but also on this actual movie that we are watching. So when the mom is left out of a portion of the film, for example, (the parts that are about Tonya and Steve,) the mom pops back up in an interview saying, “What the hell about t me? This is the part I was left out of.” It’s pretty funny. But regarding the incident, itself, there’s just not enough Nancy Kerrigan. 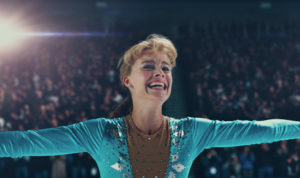 She’s barely in the movie, despite the fact that Tonya claims the two girls were friends, and at the very least, she was the big competition. We do get a lot about Steve and his friend, Shawn. The movie makes it appear that Steve wanted a death threat called into Kerrigan, and nothing more. This would prevent her from going out on the ice that day. But then Shawn took matters into his own hands and called in the attacker. It seems to be removing blame from both Steve and Tonya way too much. If this film is to be believed, then Tonya really had no idea that any of this was happening. The incident and the investigation that follows are of course the best parts of the film. They really are the parts that we have come to see, and watching the interviews with the characters involved, responding to what happened, is pretty interesting. In the case of Shawn, he is some form of crazy, insisting that he’s a counter-intelligence agent who specializes in terrorism or something like that, even though the reporter clearly knows he’s not. And then there’s a great end twist scene with Tonya and her mom, where her mother gets one last chance to show how terrible of a person she is. The movie is good and funny, with some extremely bleak humor. And it’s got a killer soundtrack of songs from the nineties. But at a certain point, with all the abuse coming Tonya’s way from both Steve and her mother, the movie does start to feel a little repetitive. It makes you think that if the Nancy Kerrigan incident hadn’t happened, then this movie would never get made, and so maybe they should spend a little more time on that incident. The same way that Kerrigan isn’t in the movie enough, neither is Bobby Canavalle, who plays the Hard Copy reporter, and is barely given any screen time. So this movie did drop the ball in a couple of ways, but for the most part, it’s an enjoyable and entertaining film.